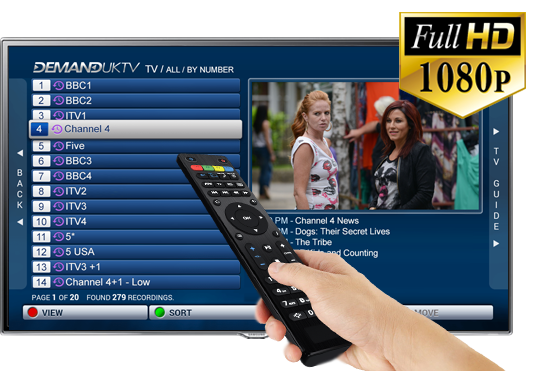 DemandUKTV’s award-winning Blade box connects straight to a TV set. In minutes, you’ll get access to dozens of live Freeview TV channels streamed direct from the UK. With its integrated 7 day catch-up service, never miss a show again. Access over 50 live 1080p HD Freeview TV channels and 50 radio stations, all streamed direct from the UK and watchable anywhere in the world. Watch any show from the past 7 days using the impressive EPG, plus record & pause live TV. 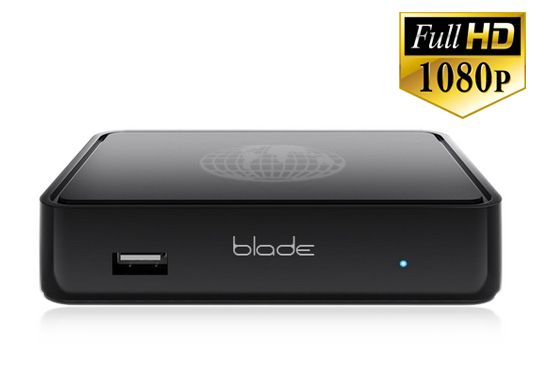 The Blade set-top box comes loaded with great features, including a fully programmable TV guide, an impressive on-demand catch up service and an easy-to-use interface, all controllable via the included infrared remote control. *All above systems require additional purchase of Blade Stream set-top box or use of compatible device. Contact us for details. What British television channels can I receive? You can receive a whole variety of entertainment channels direct from the UK. All streaming television services are provided directly by us so there’s no need to set up any third party subscriptions or contracts. Complete our quick sign up form and we’ll give you the best system with the TV you want! DemandUKTV are able to deliver a wide range of UK television channels to customers all over the world thanks to broadband internet. From our dedicated data centre in the United Kingdom, we have specialist facilities in place to stream practically any TV you like wherever you are. So if you miss watching your favourite terrestrial UK television channels then you have come to the right place – we’re here to help! To use our service, you only need an internet connection and of course… a television! You receive our pictures via a beautiful little set-top box that will sit proudly on your TV cabinet, delivering the best of British TV entertainment. What’s even better is the box automatically records all the TV from the past seven days so you watch the shows you want, when you want, wherever you are. It’s pure simplicity at its best! With DemandUKTV you get the best customer service and pricing around. No other supplier has the choice or value we offer. Simple. Just hit the “Buy Now” button and you’ll be asked to complete a short form to order your system. On receiving your order, your DemandUKTV account will be set-up and activated by our team, and your all important set-top box will be shipped direct to you so that you can start to enjoy UK wherever you are. All our service requires is a broadband internet connection. We recommend that you have an internet speed of at least 4Mbps to receive good quality streams. Our Blade Stream set top box simply plugs straight into your television via the HDMI socket and you’re ready to go. It’s that easy! Our package comes with a set range of channels. In some cases, we do offer specialist add-ons such as HD channels. We’ve carefully created a range of channels tailored to suit most tastes and demands and believe there should be more than enough to satisfy your appetite for British telly. All DemandUKTV packages come with a standard three month minimum contract period. Customers who wish to cancel their service can do so after the initial three month period has elapsed with no cancellation penalties or fees. Should you cancel, all services will be ceased and terminated effective immediately. If you purchased a Blade Stream box, that is yours to keep however access to our service via the box will no longer operate.